Protest ship headed for Gaza but how will Israel react? A protest ship, carrying no aid, is headed for the Hamas-run territory. 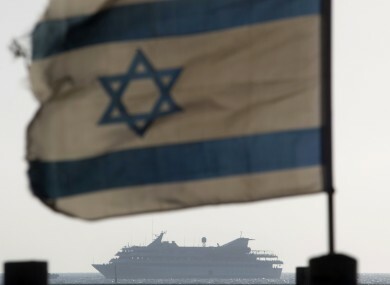 Israel has said it will stop any attempt to breach its sea blockade of Gaza. A PROTEST SHIP trying to break Israel’s blockade of the Gaza Strip has set sail and should reach the Hamas-run territory soon, a pro-Palestinian activist said today. Nahla Chahal said the ship, the Dignity al-Karama, was expected reach Gaza by Monday unless the Israeli navy stops it. The ship was part of a larger protest flotilla that had hoped to break the blockade several weeks ago but was thwarted by Greece. Speaking from France, Chahal said the Dignity left a Greek port late Saturday. It is carrying 16 passengers, including activists from France, Sweden and Canada as well as an Israeli newspaper correspondent and reporters from the Al-Jazeera satellite channel. She said the mission was solely to draw attention to the situation in Gaza: “We are making a political statement, we are not carrying any aid,” Chahal said. The Israeli military declined comment, but has said it will stop any attempt to break the sea blockade of Gaza. Israel says the blockade, imposed after Hamas militants seized control of the territory in 2007, is crucial to prevent weapons smuggling. Critics say the closure, which limits the flow of goods and people in and out of Gaza, amounts to collective punishment of the territory’s 1.6 million residents. An Israeli raid on an international flotilla last year ended in the deaths of nine Turkish activists in clashes with naval commandos. Each side has said it acted in self-defense. Also Sunday, Israeli military officials said militants have stepped up weapons smuggling into Gaza since the ouster of longtime Egyptian President Hosni Mubarak in February. The officials said armed groups in Gaza now possess some 10,000 rockets as well as anti-tank and anti-aircraft weapons. Some of the rockets can strike deep into Israel. The officials spoke on condition of anonymity because they were discussing a sensitive military assessment. Email “Protest ship headed for Gaza but how will Israel react?”. Feedback on “Protest ship headed for Gaza but how will Israel react?”.